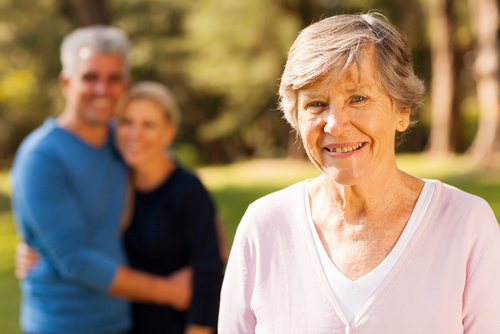 Elder care advocacy in Pinellas County, Florida | DeLoach, Hofstra & Cavonis, P.A. Helping your aging spouse or loved one is never easy. Dealing with the financial, legal and medical issues without professional help can be overwhelming. Our Life Care Planning practice is designed to help family members cope with the aging process (as illustrated by Elder Care Continuum) so that you have a team of professionals who travel through the aging journey with you. 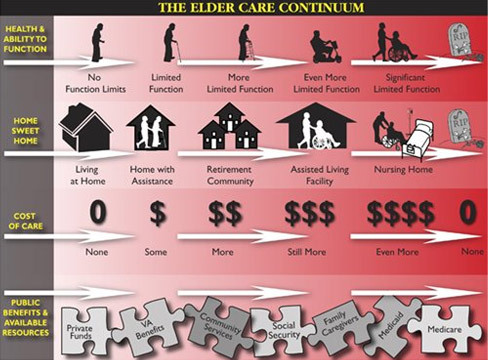 The Elder Care Continuum helps families understand the natural progression of aging and the impact on the elder's health, mobility, housing and financial resources. This helps families view the elder's journey as a process that begins long before the family members are forced to scramble to find ways to pay for long-term care. When that happens, a family member is then suddenly forced to research, coordinate and deliver the type of care for which they have no experience. Attorneys at law firms that practice the more traditional method of eldercare law are often unable to help until the very end of the elder care journey - when there is a financial crisis. However, we've put together the type of elder care team that can assist right from the beginning all the way through the end of their journey. When you work with us, you'll notice the difference right from the beginning. The focus will be on locating your loved one's position in each line of the Elder Care Continuum. Once you know where they fall in the process, we'll help you identify gaps in care, and suggest options for how to mobilize resources and public benefits to close those gaps. Our goal is to help you plan for the best care for your loved one, both now, and in the future. Medicare does not cover long-term nursing home care so the family will often look to Medicaid to help pay for long-term care. A life care planning attorney can help with Medicaid and asset protection planning. VA benefits, such as Aid and Attendance, can be very helpful in paying for a loved one's assisted living costs but there are income and asset limits for veterans and their spouses. Choosing the correct assisted living facility can be very difficult. There are an estimate 300 assisted living facilities in Pinellas County alone and finding the right one for your loved one can be overwhelming. Choosing the correct health insurance (i.e., Medicare v. HMO/PPO) will often dictate your medical choices in a time of crises. Going through the process with an aging loved one can be very, very difficult. You are alone in an unfamiliar system where getting clear answers and good care for your loved one is very difficult. With the Life Care Plan, you will get the peace of mind that comes from knowing that you or your loved one is safe, getting the right care, and that you will have a place to turn for health care, asset protection, legal and other concerns. To avoid getting lost in the system, the best time to enter into a Life Care Plan is when you or your loved one start experiencing physical or mental impairment, with or without formal diagnosis. Our Life Care Planning team will work to help assess your family’s situation, keep the entire family protected and safe, and provide the guidance needed as you travel through the elder care process. The aging process is confusing and scary, but you don’t have to go through it alone! Our Live Care Planning practice is here for you when you need help. Call us, or contact us online any time, or attend a free monthly seminar to learn more.